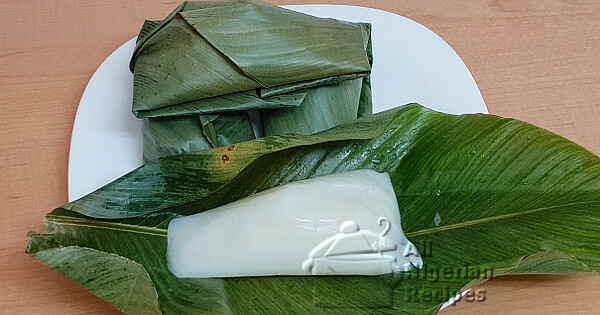 We already have a recipe for how to make agidi with corn starch. On this page, you will see how to make agidi from scratch, with corn. It is so easy to make and with corn, you get the perfect Agidi texture. Agidi makes a great breakfast meal when combined with Akara or Moi Moi. It makes a great combo with Nigerian Assorted Meat Pepper Soup. This is popularly served in Nigerian restaurants but you can replicate that at home. And can you believe this? Agidi also goes well with Nigerian Soups for swallows, especially the draw soups like this Seafood Okra Soup. Are you looking for how to make Agidi Jollof from scratch with corn? Click here. You only need 2 ingredients to make Agidi/Eko. The following ingredients gave me 5 wraps of Agidi. For wrapping the Agidi, you will need uma leaves (click here to see how I preserve uma leaves). You will need a blender for blending the corn. A chiffon cloth for separating the corn chaff from the corn starch. The name of the blender I used in the video below is Jata and it has 1200W power. Click here for a review of the blender I use in Nigeria. It is good. The corn must be dry. If you can’t buy dry corn where you live, use dry corn starch. Click here for the procedure. For the classic colour of Agidi which is white, the corn must be white. If you use yellow corn, you will get yellow Agidi. If you do not mind the yellow colour, go ahead but if you are making the agidi for commercial purposes such as to serve in your restaurant, the corn must be white. This procedure is best seen in a video so watch the video below to see it in full colour. But if you can’t watch the video, keep reading. Rinse the corn very well, put in a pot and pour water to cover the corn. Set it on the stove, cover and start cooking on medium heat. As soon as it boils very well, take it off the stove. See video below. Pour in a sieve and rinse with cool water. Blend the corn till smooth. Then sieve and rinse with a chiffon cloth, that cloth for sieving akamu. When done, cover the bowl and leave it to settle. When the corn starch completely separates from the water, slowly decant the water into a container. Scoop the corn starch into a pot, add the decanted water bit by bit, stirring at the same time till you get the consistency of evaporated milk. Note: You may need to add some hot water during the process so boil some water and set aside. Set the pot on the stove on medium heat and start stirring none stop. If you stop stirring, lumps will form, you don’t want that. Once it starts to thicken, stir even more continuously till the agidi is well cooked. Note: To confirm that it is well cooked, scoop a bit of agidi into a bowl of cold water (water from the fridge is good for this), when the agidi sets after some time, it is done. Make a cone with one leaf. Scoop some agidi into the cone and wrap. Set aside to cool down completely because White Agidi should be served cool. Serve with Akara (Bean Cake/Balls), Nigerian Moi Moi (Moin Moin), Assorted Meat Pepper Soup or Nigerian Okra Soup. Yum!